Internet Explorer 6 is a dying web browser; yet people continue to pander to it’s psychopathic needs, treating it as they would the current crop of advanced browsers. Ultimately spending time and resources propping up piles of bad code, and hack workarounds on top of shortsightedness and hubris. It is us web professionals who are prolonging the existence of IE6. 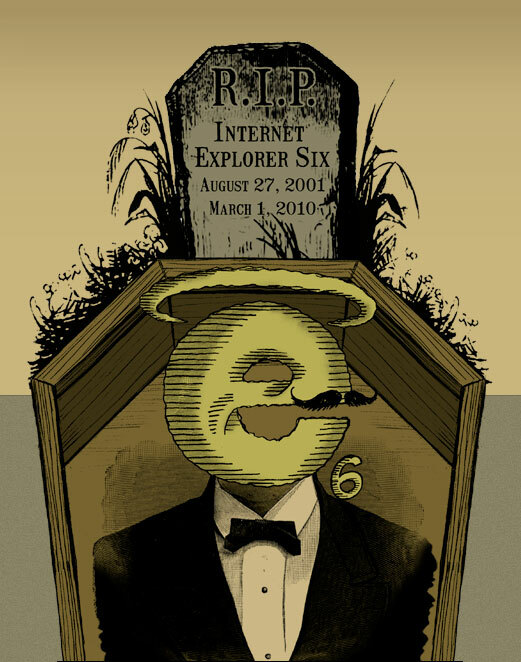 Developers support IE6 for a lot of reasons. Because they always have, their clients have yet to upgrade, or they think supporting it will give them that edge in the client pitch. The reason doesn’t matter as the result is the same. They are doing their clients a disservice, prolonging the inevitable day when the client has to spend a ton of money doing a whole site revamp or suffer the fate of becoming irrelevant on the web. Time spend tweaking CSS to IE6 bugs, and developing hacks would be better spent adding new features and improving user experience. But more insidious than quality theft is the fragile scaffolding of IE6 specific code waiting to fall over on itself. It’s a ticking time bomb waiting to bite the client and developers when they least expect it. WordPress is dropping support for IE6 for their blog’s dashboard. They’ve seen the light and know that moving forward sometimes requires a little pain now. This is huge. WordPress is a major player, and this is a psychological win for the forces of progress. The actual install base isn’t that large. It’s is most assuredly out of balance with how much chatter it gets. IE6 Countdown puts worldwide usage at 11.4%, and US usage at 2.4%. That’s not much market share for something we spend so much time on. It is our responsibility to educate our clients. They look to us as knowledgeable professionals to guide them in their decision making and to reach their business goals. Even a cursory nod to IE6 sends the wrong signal, in the same way that smoking in front of a small child is nigh tantamount to encouraging smoking. They will mimic us like we couldn’t imagine. And it is to us to promote health business patterns for their web presence. As developers we owe it to our craft to question, every time, which technology and which browsers we plan to target. Making sure that our decisions respect our selves, and our clients. Next time you start a project ask yourself if it’s life or death to omit IE6 from the process. Unless lives are on the line then it’s safe to let it go.